Cold War Air Museum: Cold War Air Museum - It's "Show Time"
As Summer approaches, with better flying weather, Cold War Air Museum aircraft fly out in support of many regional events. Recently scheduled events are listed below, visit our Current Events page to find more events as they are added. The CJ-6 will join other aircraft and hundreds of ground vehicles honoring Medal of Honor recipients at this annual event. Click for link to last year's event. This is always a great event with many people and aircraft in attendance. The Mi-2 and CJ are scheduled to attend this year. Click for link to last year's event. 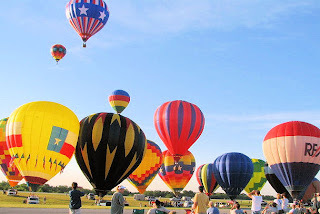 Nearby Midway airport is home to the Summer Balloon Extravaganza. The Mi-2 and Chang are flying in for static display. Click for link to last year's event.